Trump is in an alliance with Nazi terrorists. That is the only reasonable conclusion that can be made following the murder of Heather Heyer in Charlottesville on Saturday. The Nazi ‘Unite the Right’ rally which was met by a counter-protest by anti-fascists, saw a motley collection of Nazi organisations come together to defend ‘Southern heritage’ in the shape of a memorial to Confederate traitor to the US, Robert E Lee. Infamously, Trump refused to call out the Nazis, choosing instead to issue a mealy mouthed statement condemning violence ‘on all sides’. Make no mistake, this moral equivalence is an endorsement not just of racism and fascism but of terrorism. As the world knows all too well, Trump is a prolific tweeter, but decent people still wait for him to tweet his abhorrence of the racist terror brought to Charlottesville by his supporters. And if anyone is in any doubt that they are his supporters, the fascist marchers themselves made it abundantly clear by chanting ‘Hail Trump’ as they rallied. Trump is someone who respects loyalty, so we’re told. It’s why he remains loyal to the memory and the politics of his father Fred. Readers will recall that Trump’s father was a member of the Ku Klux Klan. Fred Trump marched with the Klan in New York in 1927 and was arrested for fighting with police. Like father like son is an expression that springs to mind. Be fair to Agent Orange they say, he’s ‘friends’ with Kanye West so he can’t be a racist. But discriminatory practices by one of his real estate companies, the revolting campaign to execute the Central Park Five even after they were proved innocent and of course the blatantly racist ‘birther’ campaign against Barack Obama, all are evidence of Trump’s deep-seated racism. The longer the white supremacist stays in power the more likely it is that he will sow the seeds of America’s next civil war. The lovers of the Confederacy should be able to remember how the first civil war turned out. By their friends shall ye know them. So let’s take a look at some of his friends – the ones in his cabinet. Steve Bannon – white nationalist millionaire; Jeff Sessions – white supremacist Alabaman and add to that the assorted generals and billionaires, none of whom are known for their promotion of equality and diversity. OK, so he has one black man in his cabinet, but we can safely put that down to tokenism. After what’s just gone down in Virginia, Americans should demand that those in Trump’s cabinet who claim to abhor white supremacy and anti-Semitism resign immediately. None have so far of their own volition, which tells us all we need to know about the priorities and politics of his appointees. Sadly, the Nazis are not going to go away. They certainly will not go away if people follow the advice of respectable liberal opinion that thinks if you ignore this filth it will disappear. Intimidation and violence has to be faced own. The Nazis say they will be back to terrorise Charlottesville. If that is so, then anti-fascist forces will need to mobilise much more widely and deeply. Violence isn’t the key to stopping fascism. It’s a numbers game. We are the many, they are the few. They need to be massively outnumbered and marginalised. In that battle we expect no help from Trump. In fact Trump is part of the problem. In addition, the Republicans in Congress and elsewhere have made it plain by their silence and inaction that they are prepared to go down with the racist White House bully. 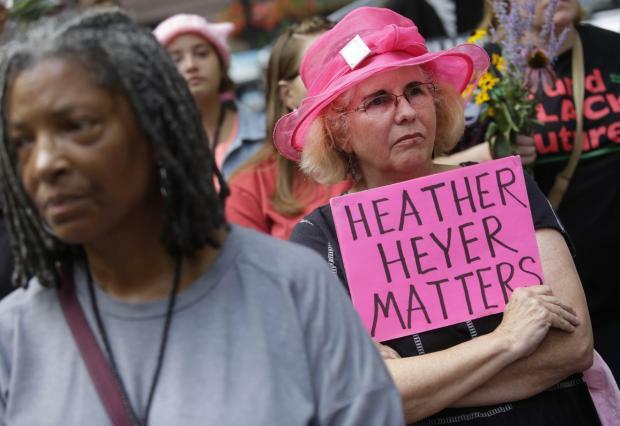 Heather Heyer is an American Hero. Let’s honour her by redoubling our efforts to rid the world of fascism. Trump is an American racist and warmonger. Justice for Darren Cumberbatch - Jail killer police!